Blakesley Effect is evident on the obverse where the rim is weak around the area of “ELIZ”. 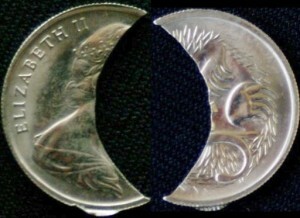 The shape of the clipped area of the coin is consistent with what would be expected when a coin is struck when such a large portion of the coin is missing. This can also be termed an incomplete planchet. 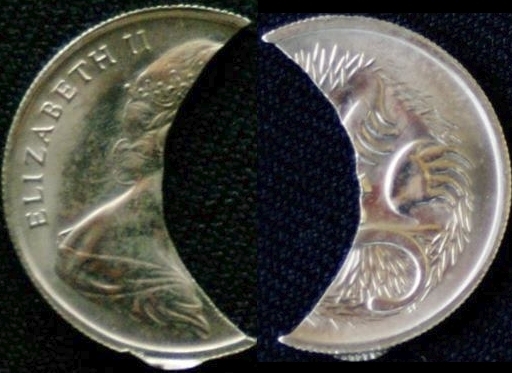 Metal will tend to flow towards the missing area of the coin deforming the crescent shape. You’d expect more metal flow into the empty area where the striking pressure is higher. That is areas of highest relief in the design. You can see exactly this on this coin. Note on the obverse image near the top of the queens portrait that the clip appears to step inwards right where the top queens head intersects the edge of the clip. The fields are deformed less meaning less flow into the missing area while the queens head is deformed more so you get more metal flowing into the missing area. Interestingly this coin also appears to have (a second error) a small ramstrike where some of the planchet metal has smooged up in the collar during the strike.